When I saw Ben Ranyard at Higgledy Garden sent out a Tweet “Anyone fancy trying their hand at guest blogging”, I immediately tweeted back “I’ll have a go”. This was before breakfast and only after my first cup of tea. He came back with “Anything you particularly wish to write about?” I replied “A tale of borage, bees and honey”. This was just before lunch and I don’t think too fast when I am hungry. It was later that evening I realised that Ben already had several posts about borage’ but the “King of Borage” was still was happy for me to go ahead with my piece. Michael Robinson, a presenter/chef on Countrywise Kitchen (ITV) recently visited beekeeper Alan Stonehouse at Paddock House Fruit Farm, nr Malton in North Yorkshire. My ears pricked up when they started to talk about Borage Honey. I am an innocent, and I grew borage for the first time this year. 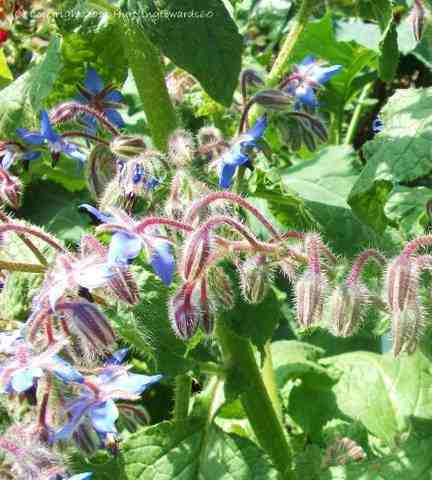 A friend of mine raised his eyes to heaven when I told him I was sowing borage : “Do you have any idea how large it grows?” he asked, followed by “You’ll never get rid of it.” with a knowing shake of the head. In hindsight, yes it was a mad idea, but only because of where I decided it would grow. I have a small, one metre square raised bed and I had sectioned it off into 6 equal squares. I was also new at growing stuff in a raised bed. The borage seed went into one of the squares. Now, anyone who knows anything about borage reading this will be laughing, also with a knowing shake of the head. 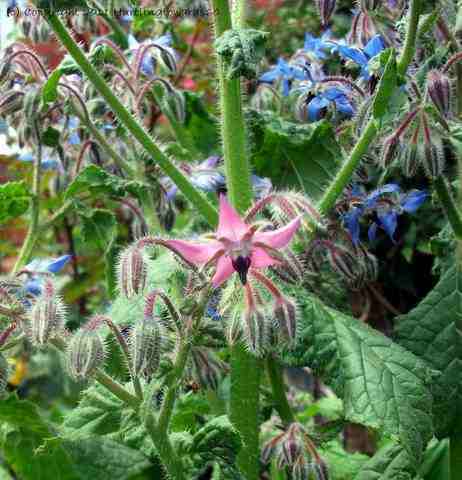 To anyone who has never grown borage before, don’t grow it in a small space – it is a thug of a plant. According to the books, it grows to a height of 90cms and about 60cms in diameter. After thinning out, I left 6 plants in my small square, still unaware of how large they were going to get. I am sure they were taller than 90cms, and the stems alone must have been 5cms, but they were fantastic! Not only was there an abundance of brilliant blue flowers, there were surprisingly the odd rogue pink ones too. I had no idea how attractive to bees it was. They came in their hundreds and the noise of the bees busy collecting their nectar was amazing. I certainly did my bit for Sussex honey this summer, which brings me back to borage honey. Can you tell the difference between Orange Blossom, Acacia, Wildflower or Heather to name a few? I suppose it’s a bit like wine, once experienced in the art of honey tasting you would know. 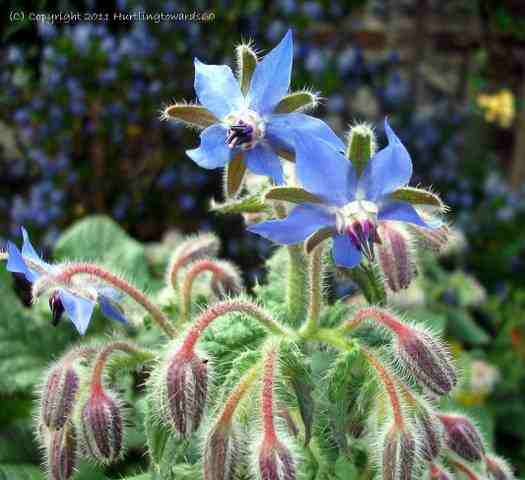 Borage honey is very pale in colour with a light, sweet taste. Apparently, people who don’t like honey usually like borage honey because it hardly tastes of honey at all. As in any program with a chef as a presenter, Michael Robinson had a honey recipe. He cooked scotch pancakes, topped them with fresh raspberries and torn mint, followed by a squeeze of lemon and then drizzled over borage honey. The piece de resistance was when he spooned off the clear honey from the honeycomb and mixed it with clotted cream to serve with the pancakes. Now, doesn’t that make your mouth water? What happened to my borage? I pulled it up a few weeks ago, it was falling over and looking a mess. Yesterday I discovered two new plants growing, it had self-seeded already. Will I grow it again next year? Watch out on my blog www.hurtlingtowards60.wordpress.com to find out more. Actually the blog is called “Hurtled to 60 and Now Beyond” but when you visit you can read why the name changed. Thank you Ben for inviting me to be your guest blogger, it has been a pleasure. If you want to know more about Paddock Farm Fruit Farm and their honey, the website has the delightful name of www.beezneezapiary.co.uk. Flower Seeds To Sow In September	Tithonia Rotundifolia, Mexican Sunflower. Very helpful info specially the closing section :) I maintain such info a lot. the pictures on this blog loading? I’m trying to determine if its a problem on my end or if it’s the blog. Often I don’t bother replying to a blog post or making any comments, but in this case I feel the need to say ‘good job’! However it was fantastic,it grew plants over a metre tall, brilliant blue flowers and the bees and butterflies loved it. Also it self seeded every year,and is proberbly still doing that even now. Last year I planted some in the garden at our holiday house,I wasn’t sure how it would go as it’s by the sea, but away it has gone and our nieghbour is very happy with the influx of bees for his hives. The smaller leaves can be used like spinach, and of course the flowers are nice in salad and in icecubes for fancy g&ts, or in pimms. I love plants that just keep on giving. Somewhere I read that honey crystallises when the bees have been at lots of daisy flowers. And once, when I had borage, I was taught to cook and eat it with spinach. One way of keeping a thuggish plant in line! The Italians stuff the leaves and bake them…the young leaves that is. Love your site…gorgeous flowers. :) We are going to start a weekly guest blogging spot if you are interested in blogging for us. We find that guest bloggers keep us on our toes and keeps the content fresh. Obviously you are welcome to link back to Elephant’s Eye.